How Many Monarchs This Winter? How Many Monarch Butterflies in Mexico? How Many Monarchs? Monarchs migrate to Mexico from across eastern North America. 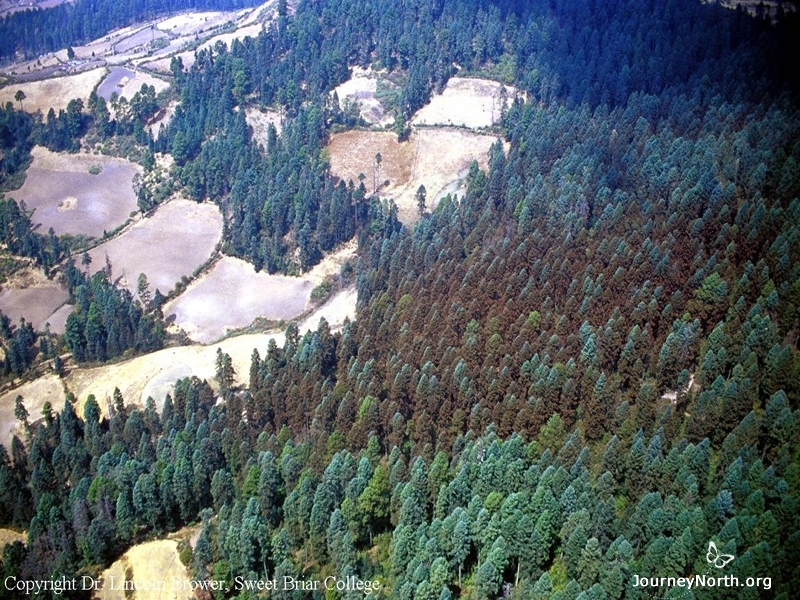 They cluster by the millions in 12 mountain sanctuaries. Because the butterflies are so concentrated, scientists can measure the size of the entire migratory population. How could they count so many butterflies? Measuring the Area Covered With Monarchs It's impossible to count individual butterflies, so scientists measure the area of forest covered with monarchs. 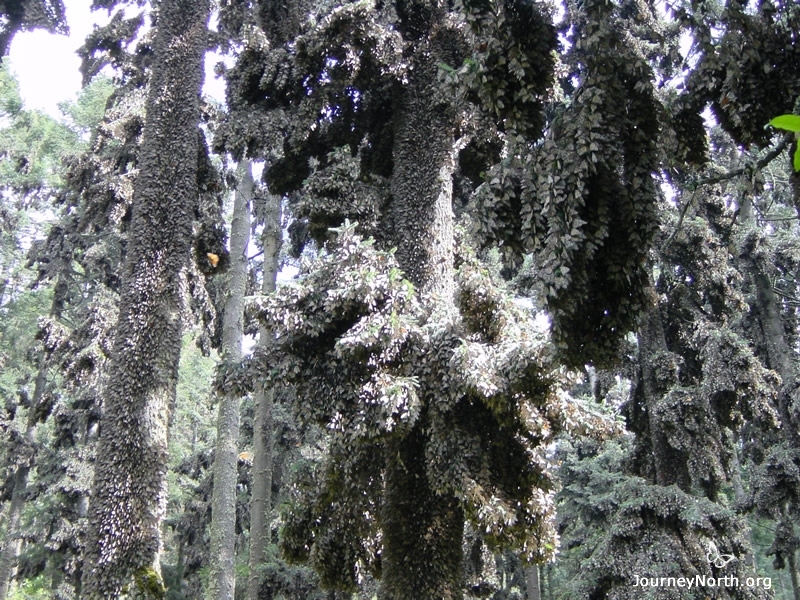 This picture shows a monarch colony from the air. The trees look orange because they are covered with butterflies. How large an area does this colony cover? 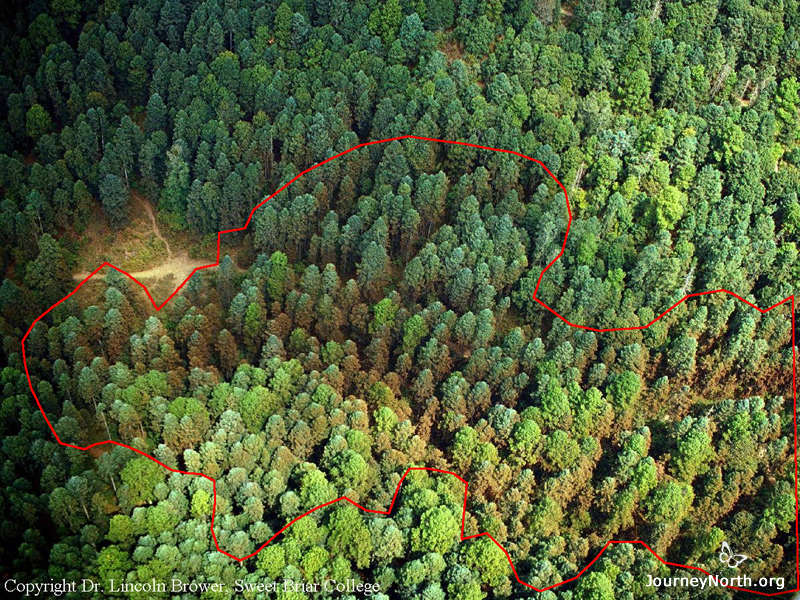 Count the trees and estimate the area. Identifying Trees in the Colony Scientists walk through the forest and decide which trees have enough butterflies to be considered part of the colony. They mark the edge of the colony with flagging tape. Measuring the Perimeter of the Colony Next the scientists walk around the border of the colony and measure the distance between all of the marked trees. 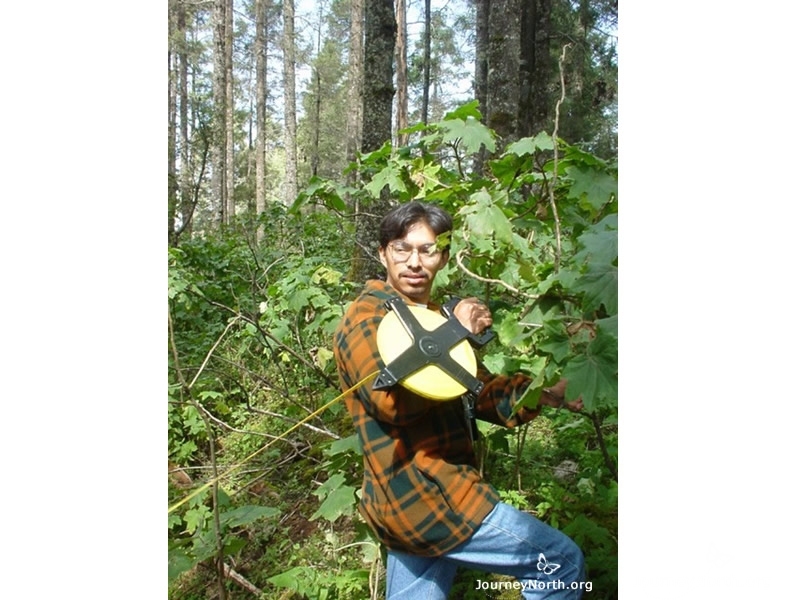 They must visit and measure all 12 of the monarch wintering sites. 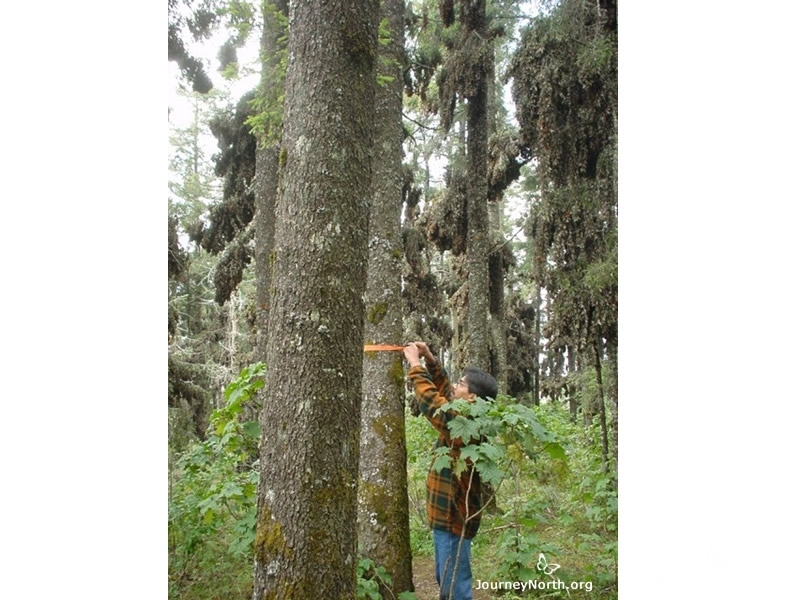 Their goal is to calculate the total area of forest covered with butterflies. Area Occupied The red line marks the border of this colony. All of the trees inside the polygon are occupied by monarchs. The area of the polygon would be calculated for this colony. 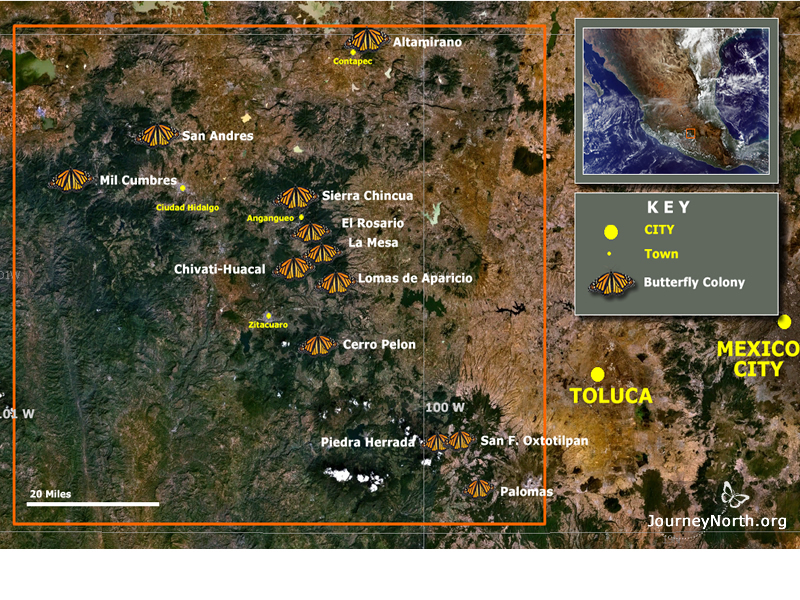 Total Area of 12 Sanctuaries Scientists measure all 12 of the monarch wintering sites. 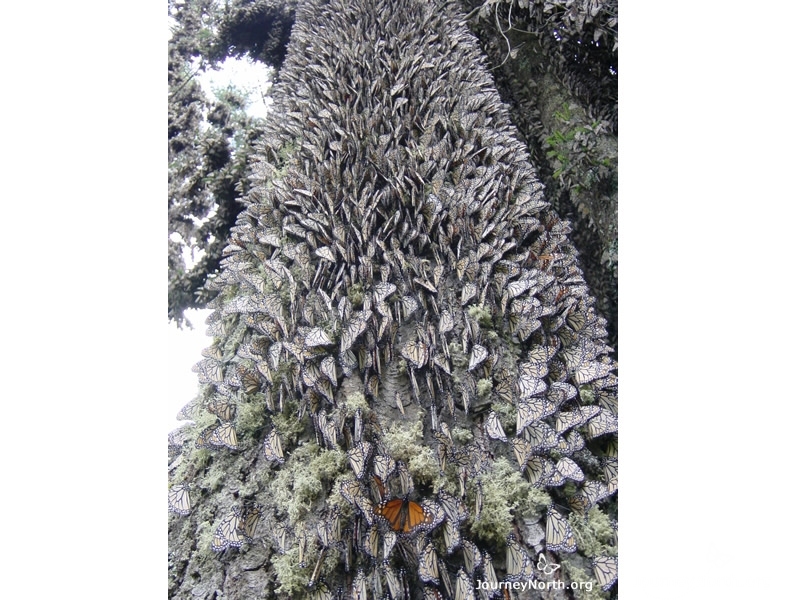 Their goal is to calculate the total area of forest covered with butterflies. Measuring During Cold Temperatures The scientists always measure the colonies in December or January. This is the coldest time of year, when the monarchs form their tightest clusters. Historic Population Data Population data have been collected consistently in Mexico since 1994. 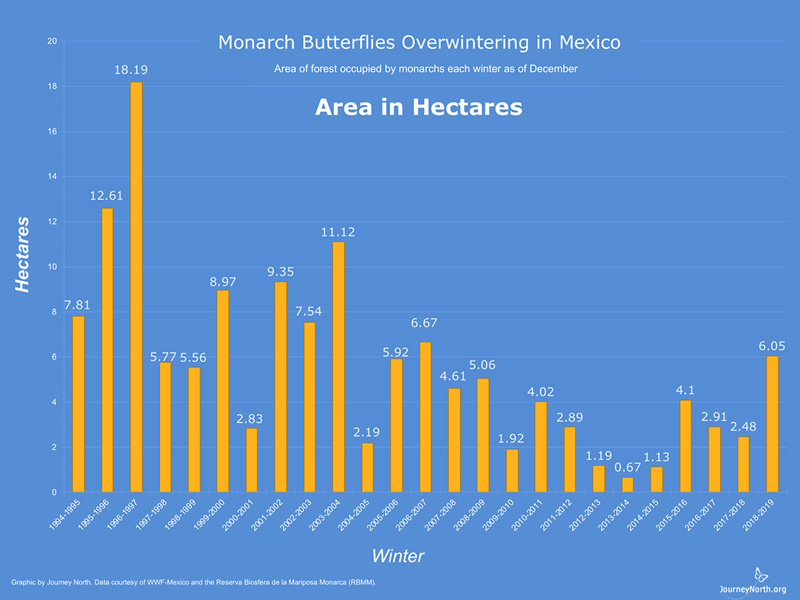 The graph shows the estimated area of forest the monarchs covered each winter. Look for trends. Why do you think it's valuable to collect population data every year? Why is it important to collect and analyze monarch population data from year to year?